Where is best spot near Perth for a budget holiday? Although we all love to take a break from time to time, holidays can unfortunately get rather expensive. However, if you know where to look, places do exist where you can enjoy a great vacation without blowing your budget. Have you ever had a budget holiday, and if so, where did you go and what kind of accommodation did you stay in? Where are the best places near Perth for a budget holiday? I really do not think there are many budget holidays left but there are still a few in Busselton though they are not so nice. It all depends on what you are looking for but Busselton has all sorts of accommodation and is close to so many interesting things. Cervantes, you can camp there and swim. You could travel along the coast to Capricorn Resort which has some camping facilities. Also near some great beaches. 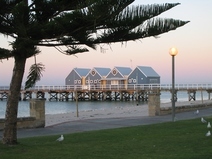 A great spot for a budget holiday close to Perth is Guilderton, a small sea-side hamlet about an hour north of Perth. There's a small affordable motel there and a lovely little camping ground, right next to the beach. The Perth Hills Centre in Beelu National Park has a great family-friendly camping ground, just a short stroll from Mundaring Weir. It's a bit hot in summer but great during spring and autumn. Perth's best raw organic cafe or restaurant? Best budget accommodation in Perth? Where are Perth's most interesting community centres? Where are Perth's best British grocery shops? Best vegetarian restaurants in Perth? Best place in Perth for a therapeutic massage? What are the best type of Easter eggs for adults? Have you ever upcycled anything?